For awhile, I’d had a mental block about this park. This is where the story gets dark, so you might want to look away (but you probably won’t). One morning in late winter, I got a disturbing text from my teenaged daughter. Her bus had gone its usual route by the park and the driver noticed too late that a body was hanging from the swings. It was barely dawn, that tricky time of light when your eyes can’t be sure what they’re seeing, so she might have thought at first it was someone’s idea of a sick joke. The driver told the kids on the bus not to look – she even said don’t look to the right, a clarity that impressed me when my daughter recounted this – but you tell a group of kids or anyone for that matter not to look somewhere, they will need to see for themselves what someone is warning them they will never be able to unsee. The hanged body was ruled a suicide, though rumors and general fear swirled for a day or two. I don’t care to speculate here, but it was an ugly, awful thing she witnessed and my heart broke a dozen times over for pretty much everyone involved, though my daughter bounced back quick enough. The bus ride the next morning was a little white knuckle, but with continued routine there was no time to develop a real phobia of the place, though she said to me last night when I dropped her off nearby for a school event that she still has no desire to go back to the park. It haunts her a little. I’d felt that way myself, but I still have a little kid that doesn’t know the ugliness of the world. At first I naively thought officials might take the swings down, but when I saw the massive steel arch last night, probably installed in the sixties, I got it. It’s as solid as the trees around it, one of which I kept staring up at after my youngest hopped up on one swing and I gave her a big push to get started. All the other trees nearby were already heavy with buds and blooms, but this one tree – and I have no idea what kind it was – didn’t appear to have any. Otherwise its trunk and branches looked healthy and ready to go, so eventually I stopped staring up and faced the swings. I heard them too, the terrible groaning, that shrieky metal on metal that seemed almost comically human, but then terribly so. My girl eventually grew bored and hopped off and we took a walk around the park, checking out a fountain under repair and the massive gazebo with its graffiti-carvings, plus all the dogs around the park. Little flitty dogs, one puffed up like a dandelion, another crouched down playfully as we walked past, and one freaking out at absolutely nothing. Once we’d made a satisfyingly leisurely lap, my daughter found a friend on the climbing structure and so leaving involved the usual bit of bargaining that makes me think all kids start out as potentially good lawyers. 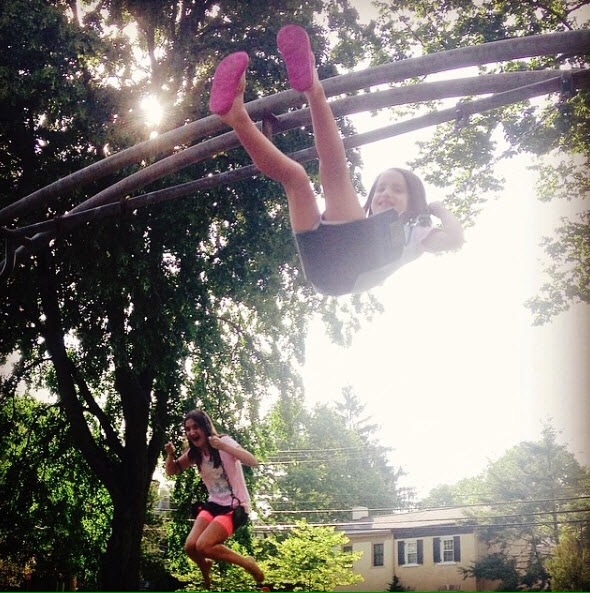 My youngest remembers coming to the park with camp last summer and how a boy shimmied up the arch of the swing to the center, an impressive and dangerous feat. My other daughter remembers something worse and I remember something in between. We all remember the fallen water ice because it was funny and sad and agreed we will come back soon with more water ice to see how the massive canopy of trees looks again in late spring. It will all be here long after we’re gone. What a poignant post. Sad but hopeful too. It shows me that whatever bad happens we do also get a chance to put that behind us. Very moving post. I find it interesting how our experiences color our perception of the same structure. Wonderful post…and quite poignant, as someone else said. You have a great voice and a knack for creative nonfiction. I’m thinking someone spiritual should lead a little ceremony at that playground. Maybe with candles or sparklers. That might relax everyone who knows what happened there, including the children. You know, Joanne, I think this was my attempt at a (personal) cleansing. The park is very old and has a rich history that goes well beyond one event. I wonder how many kids and adults saw the event. It’s safe to say dozens, maybe as many as a hundred as it was during rush hour. Time will heal but I like your idea. Do you think people realized what they were truly viewing? I wonder. We have a playground near my house that was actually built in memory of two siblings that were (yep) killed by their father. He was an average Joe but apparently went beserk one morning and this was the result. Everyone was in shock but the entire community came together and built the Rainbow’s End playground in the memory of those two children. It was a very healing thing to do. The elementary school buses were diverted by then, so there’s that. That is a terrible story about the playground. There’s one in Limerick with a similarly heartbreaking story, and another in MD dedicated to a little girl killed by a drunk driver. It’s sobering to visit and I imagine healing for those who create it. And I LOVED swinging when I was a young girl! It still is fun, except the seats! Some of them are really uncomfortable now! For me, at my older age! I know exactly what you mean. It’s still fun but oh, my aching hips. There is a power to this piece I can’t quite lay my finger on. The impact of place and memory is in the forefront, but there’s something more. Not surprising–your writing is always so beautifully layered and there’s a haunt and a feel that makes me want to read it again. Any chance you’ve read “The Singing Bone” by Rebecca Hahn? Even though the subjects are different, you channel that same beautiful and haunting voice. You say the sweetest things, Michelle. Thank you. I haven’t read her, but I’ll check it out. Finishing up A Little Life now (oof). I’ll look that one up, too. I finished my book last night. The story line was creepy, but the way she wrote it was beautiful. Beth Hahn…not Rebecca Hahn. I’m on the last 40 or so pages, so reading her flavored my brain when I read your passage. Amazing the dark depth of life that can be around any corner. Even our playgrounds. we can’t preserve that innocence in our children and it scares me to death. For some reason especially for my little girl, who will be 1 year old next month. Scares me to death. Daughters are all I’ve known, though I can imagine how it might feel scarier than raising a son. As a daughter myself, I promise we’re tougher than we look. Your girl is in good hands, and you have decades to protect and teach her. I’m late to the party, again, but I agree with all comments before me: poignant, with a little bit of everything in the mix: darkness, light, humor, sadness, despair, hope. I wish the person who took his or her life had the opportunity to read your work! I just spent the majority of the weekend at a park. Dolls in baby swings and dandelion seed wish wands on which my granddaughter and her friend wished for purple unicorns before they blew spittle and dandelion seeds into the wind. Parks, hopefully, will still be there as birthplaces of imagination when my granddaughter’s children are her age. I wish we lived in a world where the darkness doesn’t seem to be encroaching more and more on our safe places. How do we go back? This is such a good question and I wish I knew. Spending quality time with our kids and grandkids feels right, as does kindness and service to others. Hi K – I read in the comments about the man and well – how sad – I think you are right about the reasons why they don’t post this in the news – and sorry about your daughter having to see that – wow! And just a side note – Missed ya! I’m fairly new to wordpress, and not much of a writer myself but love reading. You drew me in with Water Ice, one of my favorite treats. What a horrible tragedy for children to witness and also for one’s way of life to end. You have a gift in your writing and thank you for sharing.